Snakes are the most feared animal in the city…but only a few can hurt humans, and even they prefer to avoid people. In fact, snakes are a beneficial part of Thailand’s ecosystem. Many of Bangkok’s snakes feed on the city’s mice and rats, helping to control those rodent populations and reducing crop loss and the spread of disease. 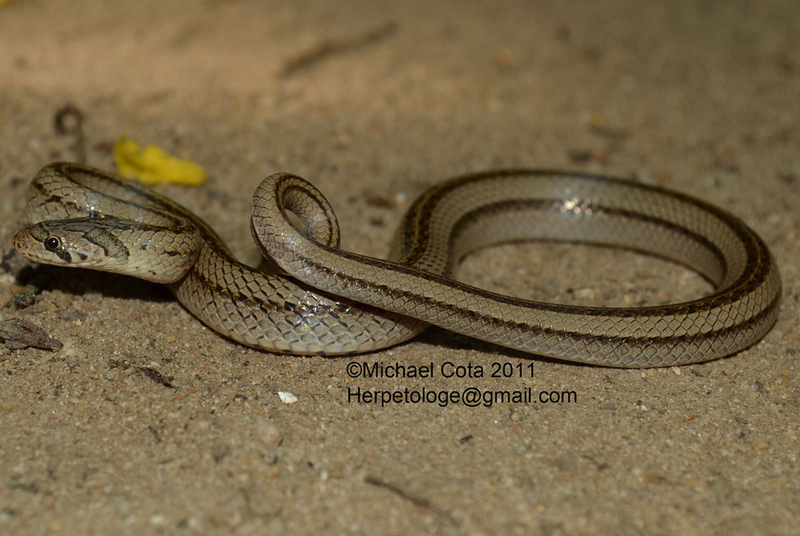 Some of the smaller snakes eat insect larvae and help to control ant and termite populations in the city. Other snakes keep fish, frog, and lizard populations in balance or provide food for birds of prey, wading birds, and other animals. However, every year a number of people in Bangkok are bitten by dangerously venomous snakes. For information on what to do if you are bit by a potentially dangerous snake, go to the snakebite page. If you saw a snake but are not sure what kind it is, take a look at the following grouped categories to narrow down the possibilities. Click on the picture to see a larger version and click on the name to go to the species account. Blind Snakes superficially appear similar to worms, though they can quickly be distinguished from worms by the fact that they don’t stretch and contract their bodies and have eyes, a tongue, and hard scales. Their small size makes them difficult to distinguish from each other, and so a scale count is often necessary to tell the different species apart. 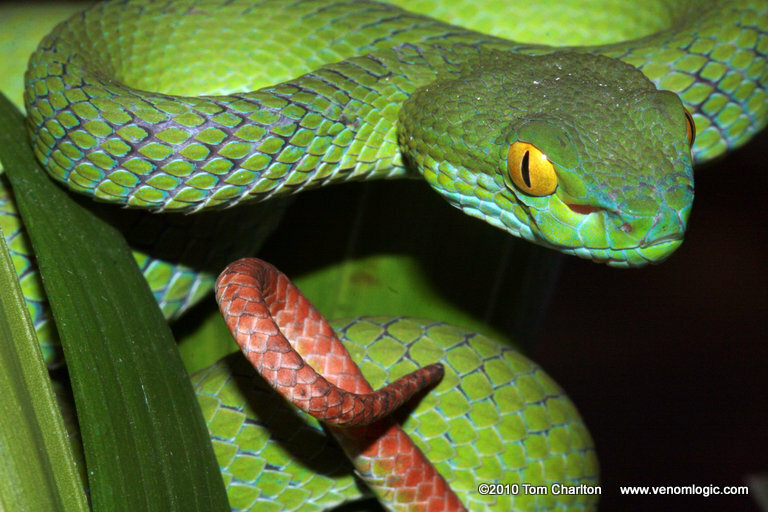 White-lipped Tree Viper – broad triangular head, white or light green on lips, venomous and dangerous! Large-eyed Tree Viper – stout triangular head, large eye, blue-green on lips, venomous and dangerous! 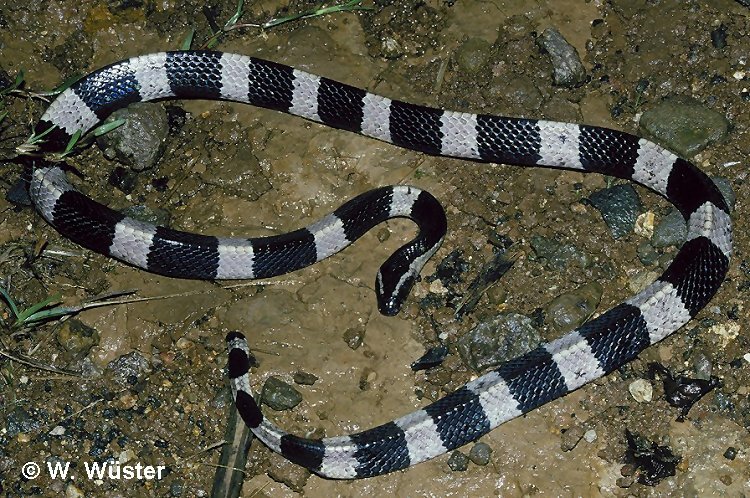 Banded Krait – triangular body, distinct dark and light bands of equal width, venomous and dangerous! 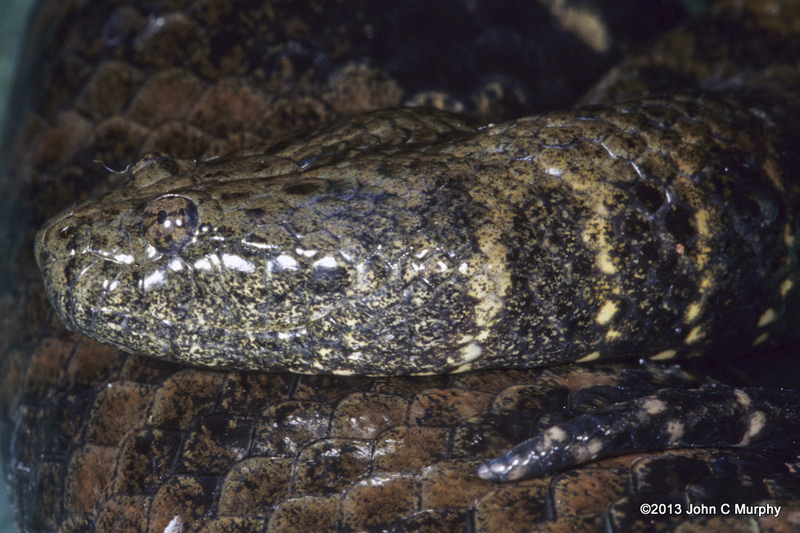 Russell’s Viper – average body, stout head, venomous and dangerous! Monocled Cobra – Large head, characteristic “monocle” on back of neck, venomous and dangerous! If live snakes are a bit too much right now, take a break with a game of SNAKE. 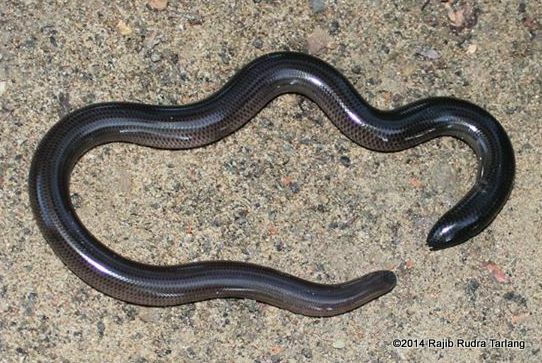 I am in malaysia, and came across a small black worm like snake, that looked like the Brahminy Blind snake, as it was small, moved like a worm , but was all black and had a couple of yellow dot markings on its back, didnt seem to be any other markings or lighter on the belly. 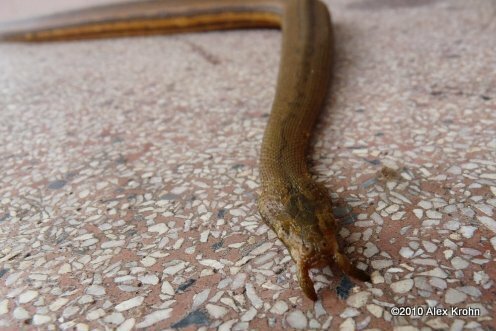 I have not seen any descriptions of snakes in malaysia that looked like that, but that snake is the closest to the Brahiminy blind snake, except for the yellow dot markings on its back, is this the same species or similar? 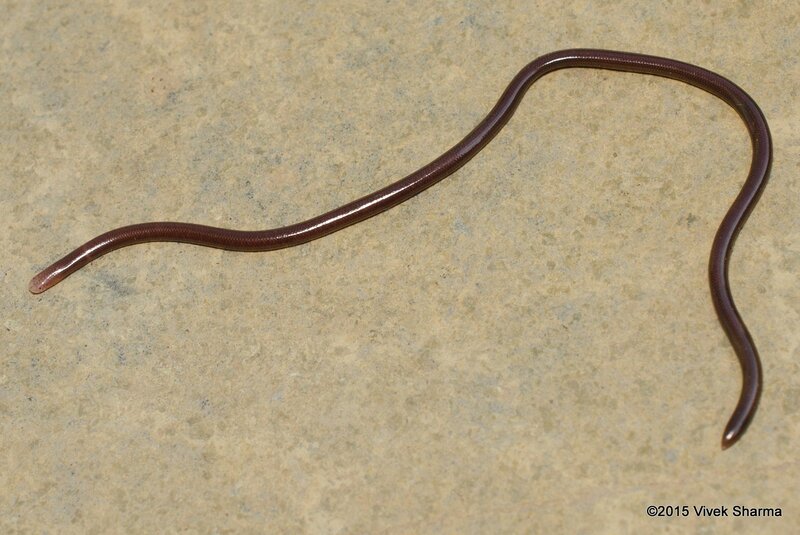 Brahminy Blind Snake would be my first guess. I don’t recall seeing a Brahminy Blind Snake with markings, but if the markings are small and there’s only a couple of them, they might just be incidental. I’m not sure what other kinds of blind snakes live in Malaysia. I live in Laos and have many snakes on my property. 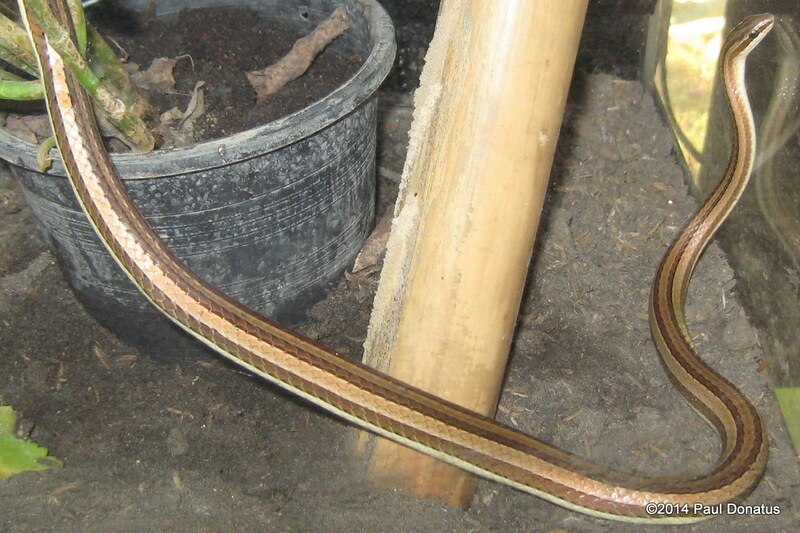 They are long and skinny and striped and have a yellow head. I assume it’s just a type of garter snake. Does this sound correct? 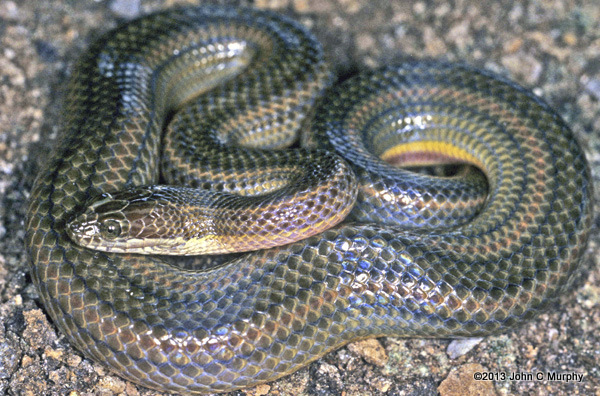 Garter snakes are only found in North America. It sounds like what you are talking about may be a type of Bronzeback (there are several species in Laos that are not found in Bangkok). An adult Reticulated Python would have no problem eating a cat. I think it would be unlikely that that’s the reason the two cats disappeared, but it’s possible. About 5 years ago we had a large python (4.5m) removed from under our terrace. She had a large belly bulge and neighbor’s cat was missing. That’s one of the largest ones I’ve heard of in the city. What part of Bangkok was it in? Were you able to get any photos? I’m sorry John Evans – the photo didn’t upload. For snake catching, you can try calling Sompop Sridaranop at 089-0438455. The fire department also handles snake removal. Hi, we spent a week on the island of Koh Kood Thailand. We found a snake in our room, the snake catcher of the hotel tried to catch it but escaped. I asked what it was but the Thai staff could only call it by its regional name which sounded like ‘Khao bang’ does anyone have any ideas what it was. It was smallish with brown markings, all the staff were wary of it so was definitely venomous. I’m sorry it took me so long to get around to this comment. 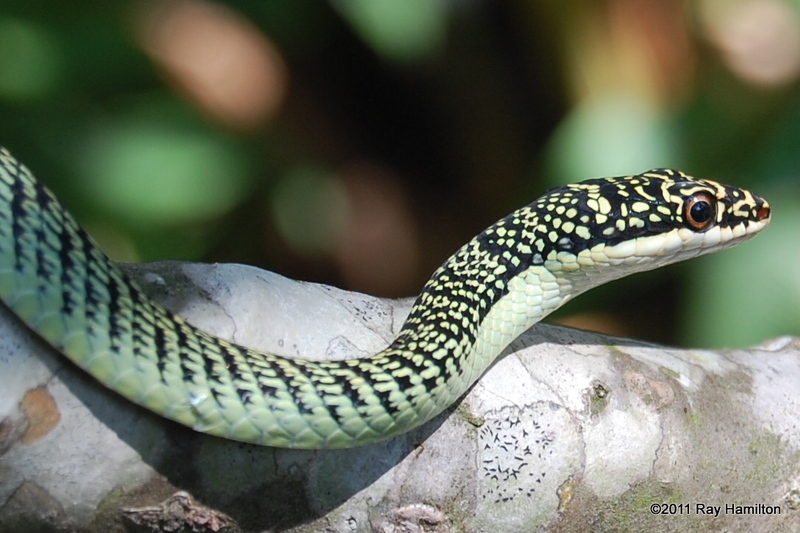 The word “khao” is often in the name of kukri snakes, which are often smallish with markings, so my guess is that it was probably some species of kukri snake. I’m not sure which one – perhaps an Ashy Kukri Snake or a Banded Kukri Snake. Unfortunately, in my experience the vast majority of people do not know which snakes are venomous or non-venomous even in their own backyard. I cannot count the number of Thai people who have told me that blind snakes are deadly, even though blind snakes are the most harmless snakes in the world! “unknown”, I’m no expert on Malaysian snakes, but that sounds like a Yellow-bellied Water Snake. It is a very common species and is usually found near water. But my housing area is like forest and the snake is black upper yellow at the bottom the eye is like a human eye white and round black pupil Is it venomous? I’m not sure – like I said, I am not an expert on Malaysian snakes. 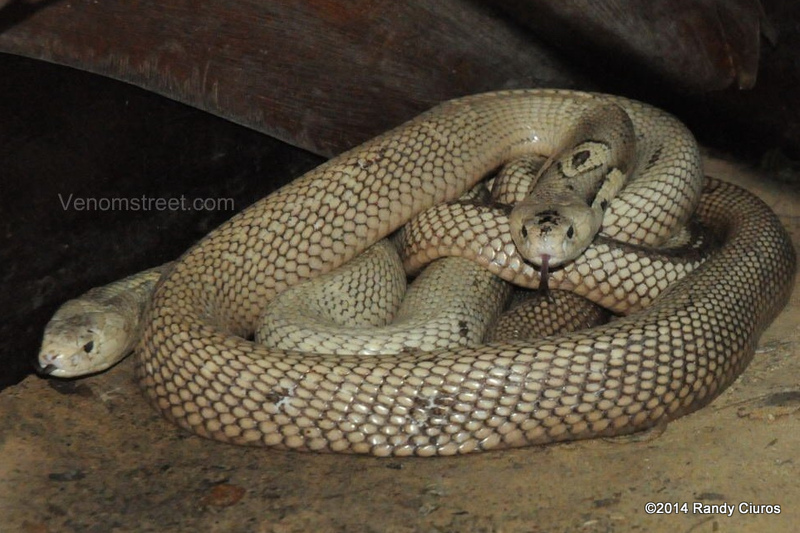 You should take a look at http://www.ecologyasia.com/verts/snakes.htm, which has many Malaysian snakes on it, to see if you can find something that fits what you saw. I’m in Thailand with my wife at the moment and was playing golf at. Luke canyon country club’s lake course in Phuket. On the 4th hole I hit a shot into a bunker and when I got there I was confronted by a large dark brown snake. It was approx 2m long and was dark brown and what looked to be solid in colour. It moved quite fast tryi g to escape the bunker. I managed to get a photo of it when it took off in he opposite direction on e it seen me. Can to identify it? A local thinks it may have been a cobra! Is it possible? If it was 2m long, it is probably not a cobra – they rarely get more than 1.5-1.6 meters long. My guess would be that it was most likely one of the rat snakes, either the Oriental Rat Snake or the Indo-Chinese Rat Snake. Those are both dark brown, move very quickly, and can reach 2.5m or longer. Thanks. I’ve since looked further into it and the closest resemblance I could see as an indo-Chinese rat snake. Hello, please help me identify a snake i met at Koh Samet island, Thailand. It was very black (ideally black), abt 1.5 meters long, tail was not round but flat (vertically, looked a little like crocodile’s tail). I nearly passed it by ATV thanks brakes were really good. Is there any chance that what you saw was a Javan Wart Snake? They rarely come out of the water, but they are very large and have a tail like the one you describe. Otherwise I might think it was a rat snake (I’ve seen an Indo-Chinese Rat Snake on Koh Samet myself), but their tails are round. What species is this, from Bangkok, Thanks! That looks like it’s probably a White-lipped Pit Viper. 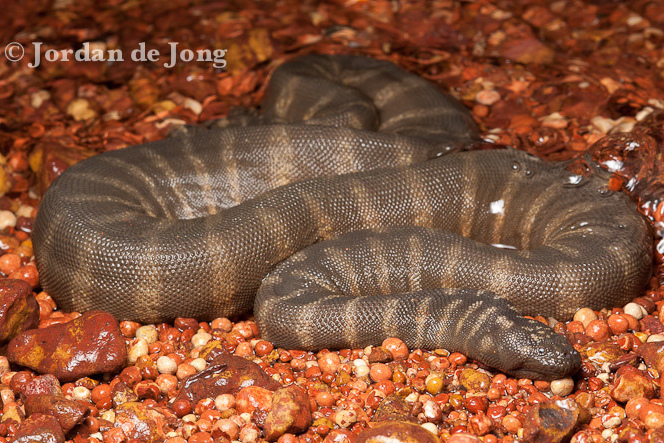 They are venomous, and can cause severe pain and some other effects, but are very rarely fatal. 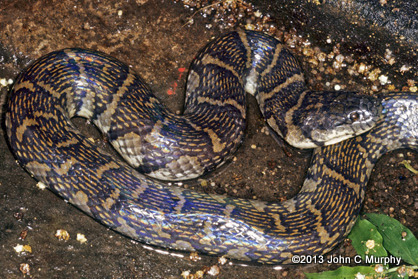 I was able to get a picture of Siegfried’s snake via email, and was able to identify as a Blue Bronzeback, Dendrelaphis cyanochloris, by using Ecology Asia and a few other sites. Do you have a link for me to see the snake? Black body yelow head in next door. S house. Whot is it please.. Please post a picture somewhere or take a look at the pictures in this guide or on the references page. 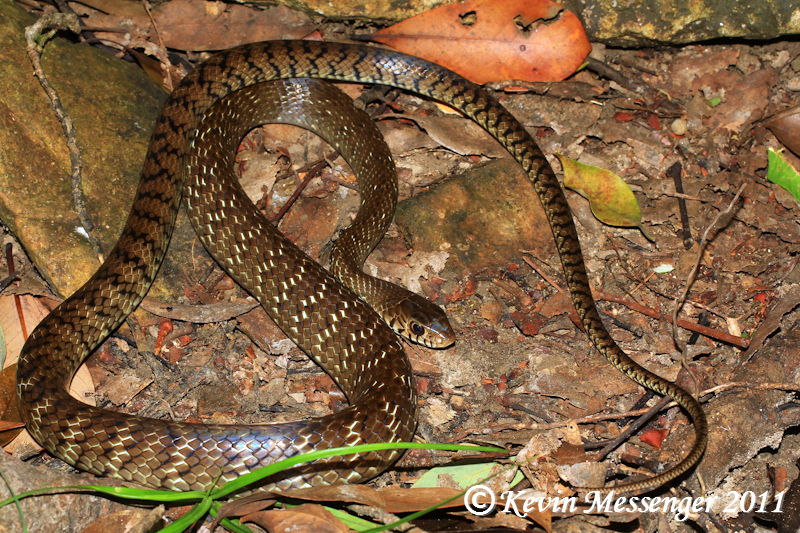 It can be very difficult to identify snakes from limited descriptions. .,???????? is Brahminy Ciegos Snake ????????????????? Sorry – your pictures didn’t upload. Those are actually eels inside that pail. And they eat them! Pics are not very good since it was dark and those are snapshots from a video my husband shoot…. What do you think? Could it be a baby cobra? Like you say the photos aren’t perfect, but that certainly looks like a little cobra to me. If you are concerned then there are snake removal services you can call in Bangkok. The most important thing to stay safe is to not try to touch or kill the snake yourself – that’s one of the main ways that people end up getting bit. I found this snake at my house. is it venomous? Where are you? That doesn’t look like any venomous snake that I’m familiar with, but I shouldn’t say so for sure without a positive identification. Knowing where you are located would help. Hi saw a snake in my yard but was too slow to get a proper look at it this time to identify it but it was largish approx. 4 to 5 feet, brown looked solid color maybe bit lighter on bottom and its tail instead of going gently to a point it suddenly dipped in then went to point, like you had cut a smaller snakes tail off and put it on this bigger one, any idea from this if poisonous or not ?? It sounds likely that that was a rat snake, but I couldn’t be certain from the description – there’s an outside chance that it could be a cobra. The easiest way to tell the difference is to get a good look at their heads. I saw a small, worm or snake-like, smooth skinned creature in Chiang Mai while hiking. Is it a snake or a worm? It is black with a tan head that looks like a hatchet. How can I post a picture? That sounds like a kind of flatworm called a bipalium. They’re also known as “hammerhead worms” or “shovel-headed garden worms”. I see them myself from time to time on hikes, including one near the top of Chiang Mai. They’re quite a strange sight! i saw this snake swimming in Khu muang doem in bangkok. Just wondering if you knew what kind it was. For some reason your facebook photo is “no longer available”. Last night had a very dark snake nearly black snake go round the back of the house. It was about 1.5-possibly 2m in length, about 2-3 inches wide and small head and thinish neck and a long tapering tail. Scared to go and look but from looking at the pictures and reading the description it could possibly be a rat snake or a (king? ) cobra. What is the main difference between the look of these two besides one is dangerous and the other no so. I live in Krabi next to a rubber plantation and a mountain. You certainly shouldn’t touch the snake unless you know exactly what species it is. King Cobras are responsible for a low number of bites and even lower number of fatalities…but the #1 way to get bit by one would be to grab it. From your description of the “long tapering tail” and the “small head”, I would suspect that it’s most likely to be a rat snake. Rat snakes have somewhat smaller heads and longer tails than cobras. Also, rat snakes are far more common than king cobras. However, that’s just a guess – I wouldn’t be sure without seeing the snake’s head myself. Hi and thanks for a very informative page. My fammily just returned from a Thailand trip where we visited the Koh Kut island. 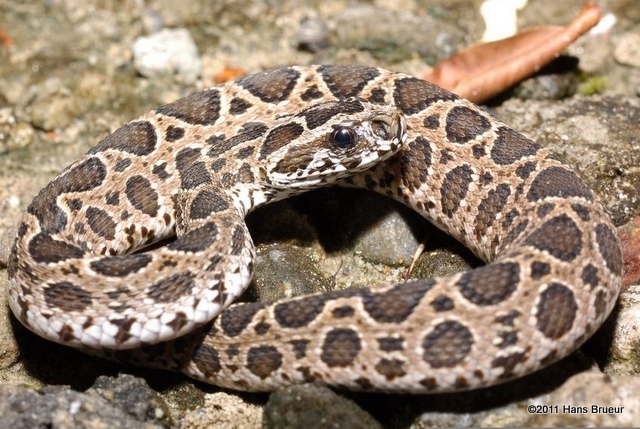 I wondered if snakes at all lived on these islands, but a motorcycle trip changed my mind. I stumbled upon this snake tail sticking out of a hole in the cliffs at the side of the road. The tail itself was long around 70cm. So i guess this is a rather large snake maybe 2 meters. The skin was grey without markings, and a lighter belly scale, clearly one single scale. There was a change of color in the middle of the tailpiece to a lighter shade of grey. Looking at various sites I start to think that this was a King Cobra. Is this true? We eventually left the place and came back an hour later. The snake was in the exact same place, so i guess it could be dead, and I took these pictures. Sorry about the poor quality of the images. But i did not dare to get any closer. To my eye, it looks like it is indeed dead, and it could possibly be a King Cobra. I’m not experienced enough with the species to identify them from that piece of the body alone though. Hi there. Thank you so much for your page. I was in south central Vietnam and was swimming in Bung River, near Phong Nha. I saw this snake hunting in the river. It lifted its head up and I snapped this photo. The portion above the water looked to be about 40cms. I was up on the bank at the time, so the enlarged photo is not great quality. It seemed to be uniform brown color. Any idea what type of snake it might be? Thank you! Thats a neat observation, but I can’t tell the species from that photo. Hi, I’m in koh phangan at the moment, and I found two snakes I would like to identify and know if they are dangerous. 1.- hiking Khao Ra, a 20cm red baby snake with two black lines in the tail. 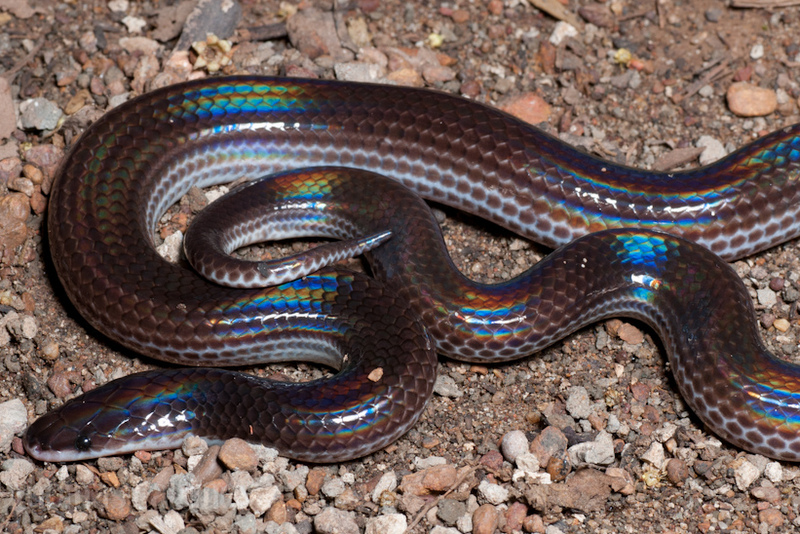 #1 may be a brown kukri snake, oligodon purpurascens. If you look online you will see they are usually brown but some examples are more reddish. 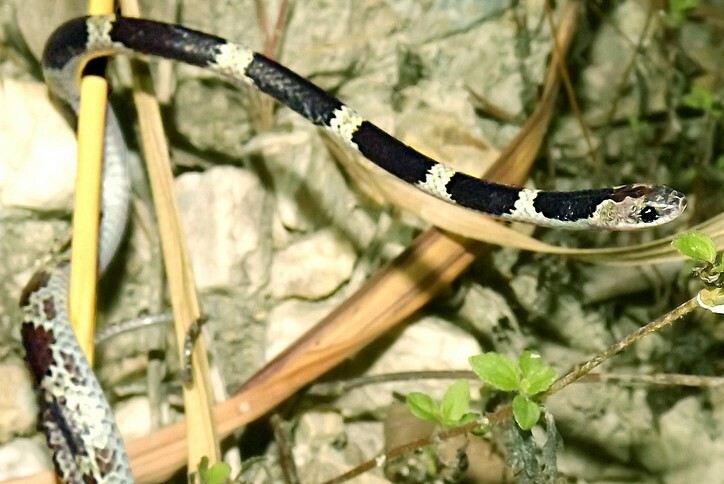 It also might be some other species of kukri snake, or there’s a very outside chance it could be a venomous coral snake, Sinomicrurus macclellandi. Look for pictures of each online. #2 sounds like there’s a good chance it’s one of the Bronzeback species, such as a Striped Bronzeback, Blue Bronzeback, or Elegant Bronzeback. You’d have to look up information to see which ones are found on that specific island. Hi, I am a snake handler from Tasmania, Australia. I am hoping to visit Thailand in the middle of 2016. I was hoping you may know some one i could get in contact with in regards to me tagging along on afew snake rescues. In retrospect I certainly wished I had made those connections! I also wanted to tag along on rescues. Unfortunately, with the business of my schedule and my lack of personal transportation, I never felt that I’d be able to make it, so I didn’t develop the necessary connections. 10-00 am in bright sunlight. The snake was about 2 meter and about the thickness of a broom handle, it was olive green in color and had lighter markings all down its body. It seemed to be triangular, ie the body flat to the road and was zigzagging, half a meter then a bend in its body and so on. The area was flat with rice fields. I would think a rat snake, most likely an Oriental Rat Snake. 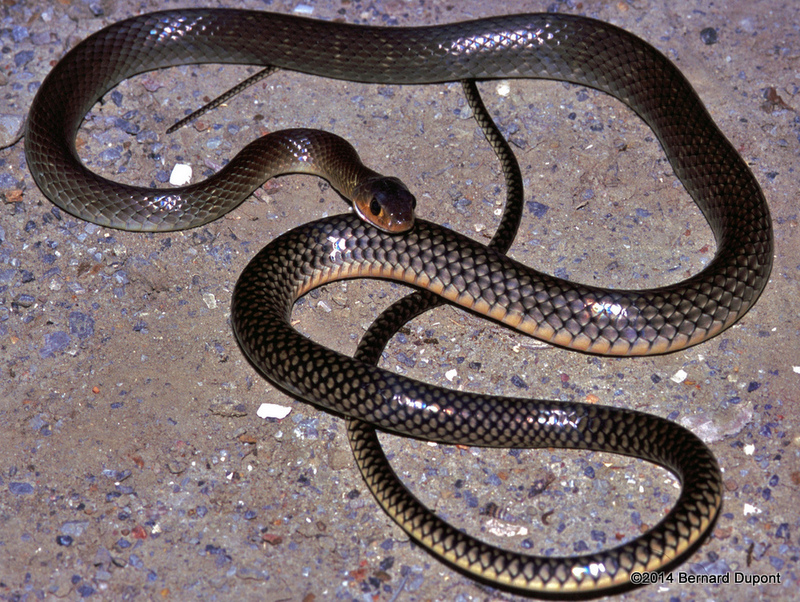 They can have an olive coloration and light markings, and are one of the few snakes that gets that large. They are also common in exactly that habitat. I live in Nonthaburi, Thailand and at the back of my house is a large orchard, but rater unkempt and shrubby with shallow canals where they get water for watering the trees. 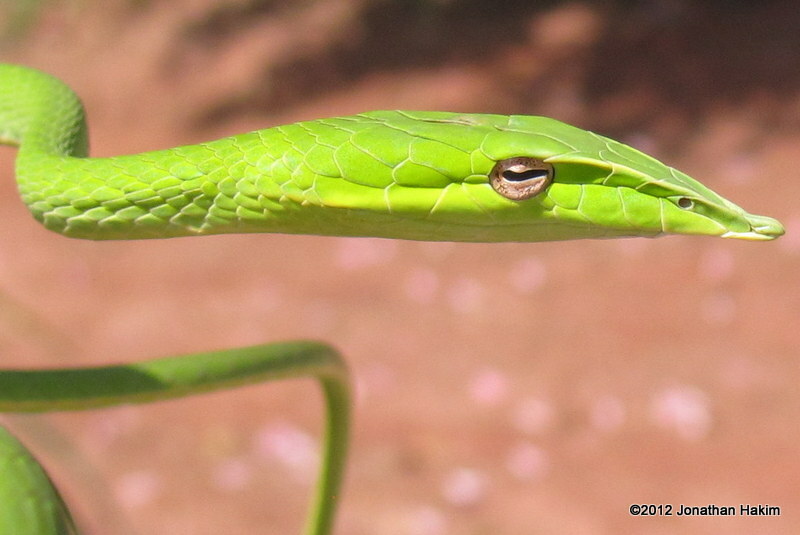 Based on the description and picture, I think that what I see often in my garden are green tree vipers. How big can they get? Most of the ones I see are small and the biggest is the size of a finger. 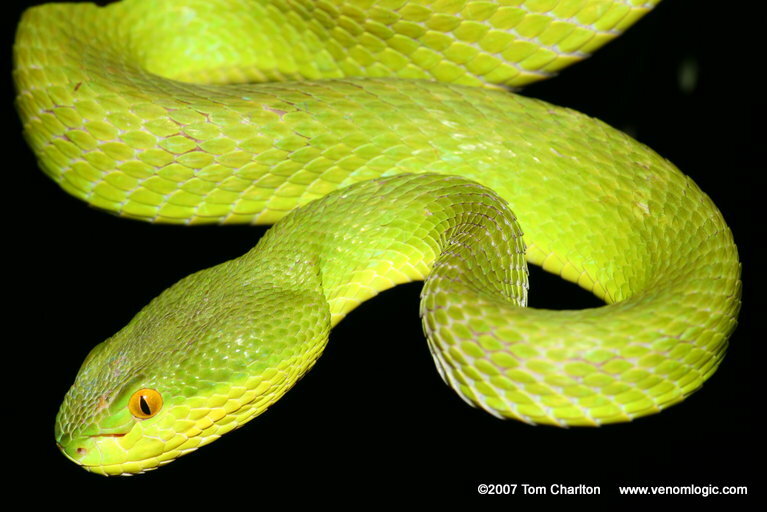 There are several species of green pit vipers, and they vary a lot in size. The two species found in Bangkok are both rather small, but there are some other species in Thailand that get much larger. Sometimes juveniles are also a lot more common and easier to see than adults, so it’s possible that the ones you’ve seen in your garden so far have all been juveniles. im from malaysia..i found a yellow snake with some black spots on its head and the belly was reddish white and the head was so small,what is that?? I found a snake on the tree in koh pangan. The haed of it looks like noiga but im not sure. Is it posible to sand a photo and to get help with the recognition? Yes, please do! If you post a link to the photo or send me your email I can take a look at the photo for you. That appears to be a juvenile rat snake. 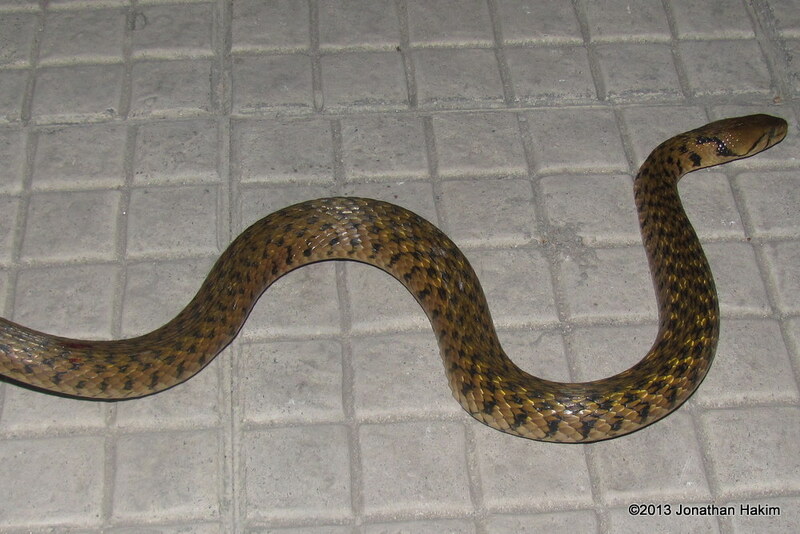 I think it is probably an IndoChinese Rat Snake (Ptyas korros), though there’s a chance it could be Ptyas muscosus. Sorry forgot photos – not very good, sorry. Hello! Would you be able to identify the snake in the picture? I saw it while climbing to a top of one of the smaller island near Cat Ba, Vietnam. It was quite small, I’d say max 30 cm. That appears to be a beautiful Golden Tree Snake, Chrysopelea ornata. Yours is just a juvenile. I’ve never seen one with such striking black bars though, it’s a very nice-looking individual.